1 October 2009 – present. Although the previous Carrier Strike Group One traced its history to Carrier Division 1, formed in 1930, the current Carrier Strike Group One was an entirely new naval formation when it was established in October 2009. During the relocation of its flagship Carl Vinson to its new home base in California, it supported Operation Unified Response, providing humanitarian assistance following the 2010 Haiti earthquake. During its first overseas deployment in 2011, the body of Osama bin Laden was flown to the Carl Vinson for burial at sea. Carrier Strike Group One was the second U.S. Navy carrier force to participate in Operation Inherent Resolve. Carrier Strike Group 1 traces its lineage to Carrier Division 1 (CarDiv 1), the U.S. Navy's first seagoing naval aviation formation. It was first organized in October 1930 as part of the Aircraft Scouting Force, U.S. Fleet in the Atlantic. It initially included the U.S. Navy's first aircraft carrier, the Langley, as well as the aircraft tender Wright and the minesweepers Sandpiper and Teal. In 1933, USS Saratoga (CV-3) was reassigned to Carrier Division One under Commander Aircraft, Scouting Force, which also included aircraft tender Wright; the minesweepers Lapwing, Teal, and Swan; and the rigid airships Akron and Macon. Carrier Division One was initially headquartered at the Coco Solo Naval Air Station located on the Atlantic side of the Panama Canal Zone near Colón, Panama. In 1939, Carrier Division One was transferred to the Pacific Scouting Force. Division aircraft carriers saw service in World War II, the Korean War, and the Vietnam War. Rear Admiral John H. Cassady served as Commander Carrier Division 1 immediately after the end of Second World War. In this capacity, Cassady commanded Task Group 21.11, led by the carrier Franklin D. Roosevelt, during Operation Frostbite in February 1946. This naval exercise involved the embarked Air Group 74 conducting flight operations in Davis Straits between Labrador and Greenland. Previously, U.S. Naval carrier aviation had virtually no experience operating in Arctic waters. Subsequently, Admiral Cassady commanded Task Group 125.4, consisting of the carrier Franklin D. Roosevelt; the cruiser Little Rock; and the destroyers New, Cone, and Corry, which paid a highly publicized port visit to Piraeus, Greece, in September 1946. In conjunction with earlier visits, including that of USS Missouri (BB-63) to Turkey, this port call demonstrated U.S. support to Greece and Turkey in the face of Soviet pressure. According to James Chace, the deployment of Task Group 125.4 "symbolized" American resolve against that Soviet pressure, marking the true beginning of the Cold War. In 1952 Commander Carrier Division 1 was flying his flag aboard USS Bon Homme Richard (CV-31) off Korea. In August 1955, Carrier Division 1 comprised USS Yorktown (CV-10) at Puget Sound (in refit, receiving an angled flight deck), USS Hornet (CV-12) at San Francisco, and USS Hancock (CV-19), and USS Boxer (CV-21) both at San Diego. In 1968, Carrier Division 1, under the command of Rear Admiral Epes, became involved in the response to the seizure of the USS Pueblo. In June 1973, Carrier Division 1 was redesignated Carrier Group 1 (CarGru 1), and in January 1974, it was located at North Island, California. Despite being headquartered at North Island, it was responsible for the Midway, which with Carrier Air Wing Five aboard had moved to United States Fleet Activities Yokosuka, Japan, on 5 October 1973. The move was the result of an accord signed on 31 August 1972 between the U.S. and Japan. In addition to the morale factor of dependents housed alongside with the crew, the move allowed continuous positioning of three carriers on the Pacific Rim at a time when the economic situation demanded the reduction of carriers in the fleet. In December 1990, following commanding Battle Group Delta, ComCarGru 1 was designated Commander, Training Battle Group, with responsibility for the Carrier Battle Group Inter-Deployment Training Cycle for the Pacific Fleet. In 1996 the group was commanded by Timothy Beard. 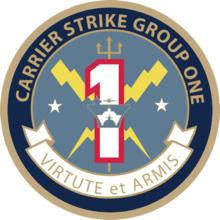 On 1 October 2004, Carrier Group 1 became Carrier Strike Group 1. In 2005, it was redesignated Commander, Strike Force Training Pacific. On 1 October 2009, Carrier Strike Group 1 was re-established based at Naval Base Point Loma, California under Rear Admiral Ted N. Branch. Commander Carrier Strike Group One (COMCARSTRKGRU 1 or CCSG 1) is responsible for unit-level training, integrated training, and material readiness for the ships and aviation squadrons assigned to the group. Carrier Strike Group One reports to Commander, U.S. Third Fleet, which also supervises its pre-deployment training and certification that includes Composite Unit Training Exercises. When deployed overseas, the strike group comes under the command authority of the numbered fleet in whose area it is operating (Third, Fourth, Fifth, Sixth, or Seventh Fleets). When deployed in this fashion, the group utilizes a task force or task group designator, for example, Task Group 50.1 in the Fifth Fleet area. On 12 January 2010, Carl Vinson, departed Naval Station Norfolk for its new homeport of San Diego with squadrons VFA-81, VAW-125, VRC-40, and HS-15 embarked. Just hours after the 2010 Haiti earthquake, Carl Vinson was redirected from the North Atlantic to Haiti to contribute to the Operation Unified Response relief effort. On 15 January, the Carl Vinson arrived off the coast of Port-au-Prince (pictured) to provide humanitarian aid, with its trained personnel, emergency relief supplies, and 19 helicopters on deck. On 16 January, the Bunker Hill arrived in Haiti to assist the Carl Vinson. In addition to providing medical relief, Carl Vinson's desalination capacity provided fresh drinkable water to Haiti's population. In total, the Carl Vinson delivered 1,095,442 lbs. (496,884 kg.) of food; 147,591 gallons (558,693 litres) of potable water; and more than 40,000 lbs. (18,143 kg.) of medical supplies. The ship's medical team treated 60 patients. The Vinson's embarked helicopters flew 1,299 sorties, conducted 1,152 medical evacuations, and delivered more than 2,900,000 lbs. (1,315,418 kg.) of cargo ashore. On 1 February, the Carl Vinson, the cruiser Bunker Hill, and the oceanographic survey ship Henson ended their mission and departed Haiti although ten of Vinson's helicopters remained to support the relief effort. In March 2010, during her transit around South America, the carrier strike group participated in Southern Seas 2010 naval maneuvers with the Brazilian, Uruguayan, and Argentine navies. The group also paid port visits to Rio de Janeiro, Brazil, and Callao, Peru. Carl Vinson arrived at its new homeport on 12 April 2010 following a three-month underway period. On 26 October 2010, Rear Admiral Samuel Perez, Jr. took command of the group. The group departed California for its 2010-11 deployment on 30 October. During the deployment, Carrier Air Wing Seventeen flew 1,656 combat air sorties, logging a total of 9,140 flight hours while 33 bombs and 2,970 rounds of 20-mm ammunition were expended. On 5 May 2011, as part of NATO's counter-piracy Operation Ocean Shield, Vinson, Bunker Hill, and the Turkish frigate Giresun responded to a distress call from the Panamanian-flagged, Chinese-owned bulk carrier Full City. An Indian Navy Tu-142 maritime patrol aircraft located the Full City, and while Giresun boarded the merchant vessel, Bunker Hill and its embarked HS-49 helicopters intercepted a dhow believed to be the 'mothership' for the pirate attack (pictured). Bunker Hill's boarding party seized weapons and other equipment commonly used in piracy, and the boarding party also sank a small skiff being towed by the dhow. Giresun's boarding party found the Full City's Chinese crew safe and in control of their ship. On 15 June 2011, Carl Vinson returned to its homeport of Naval Station San Diego, California. On 18 November 2011, Rear Admiral Thomas K. Shannon took command of Carrier Strike Group One. On 30 November 2011, the strike group departed Naval Air Station North Island, California, for its 2011–2012 deployment. On 10 January 2011, two guided-missile destroyers from Destroyer Squadron One, Stockdale and Gridley, and their embarked detachments from helicopter squadron HSL-49 participated in a passing exercise with the Japanese helicopter destroyer Kurama in the Sea of Japan. Later in the same day, Stockdale and Gridley participated in separate maneuvers with units of the Republic of Korea Navy. Also, during its maiden deployment, the new British guided-missile destroyer Daring operated with Carrier Strike Group One and Carrier Strike Group Nine in the Persian Gulf and North Arabian Sea. On 19 January 2012, while serving as the flagship of Combined Task Force 151, the destroyer Halsey and its HSL-49 helicopter detachment responded to a distress call from M/V Albrouj, a Yemeni dhow en route to Somalia from Yemen. Carrier Strike Group One joined Carrier Strike Group Three, led by the carrier John C. Stennis, in the North Arabian Sea, with Carrier Strike Group Nine, led by the carrier Abraham Lincoln, en route to the Arabian Sea amid rising tension between the United States and the Islamic Republic of Iran over U.S. naval access to the Strait of Hormuz. While with the Seventh Fleet, between 9–16 April 2012, Carrier Strike Group One participated in Malabar 2007 with the Indian Navy (pictured). Ships of the strike group paid a port visit to Brisbane on 5 May 2012 to mark the 70th anniversary of the Battle of Coral Sea. Between 7–16 May 2012, Carrier Strike Group One became the first U.S. Navy carrier strike group to participate in the Oceania Maritime Security Initiative, a maritime law enforcement operation within the exclusive economic zones of various South Pacific states. On 11 May 2012, Carrier Strike Group One entered the U.S. Third Fleet area of responsibility. On 23 May 2012, the carrier Carl Vinson, the cruiser Bunker Hill, and the destroyer Halsey returned to Naval Air Station North Island, California, concluding the six-month-long 2011–2012 deployment for Carrier Strike Group One. During this deployment, aircraft from Carrier Strike Group One flew 1,085 missions in support of ground forces in Afghanistan, totaling 6,600 flight hours, while delivering 7,283 pounds (3.3 MT) of ordnance and expending 1,717 rounds of 20-mm ammunition in support of coalition operations in Afghanistan. On 5 July 2012, the carrier Carl Vinson began a planned incremental availability (PIA) overhaul to undergo major maintenance and modernization, with a scheduled completion date of 1 February 2013. The Carl Vinson completed its maintenance on 3 February 2013 and began carrier qualifications with Carrier Air Wing 17 (pictured). Between 2–14 May 2013, the Carl Vinson and Carrier Air Wing Seventeen completed their Underway for Tailored Ship's Training Availability (TSTA) pre-deployment exercises. On 22 March 2012, the cruiser Bunker Hill began its five-month Drydocking Selected Restricted Availability (DSRA) overhaul at the BAE Systems San Diego Ship Repair facility. The destroyer Gridley began its selected restricted availability (SRA) yard at BAE Systems San Diego Ship Repair facility on 26 June 2013. Gridley began its sea trials on 7 October 2013. On 17 November 2013, the destroyer Higgins began its five-month Selected Restricted Availability (SRA) upkeep. The frigate McClusky completed its three-month Selected Restricted Availability (SRA) upkeep in January 2013. On 21 February 2013, Rear Admiral David F. Steindl relieved Rear Admiral Thomas K. Shannon as commander, Carrier Strike Group One in ceremonies held aboard the group's flagship, the Vinson. A surface warfare officer, Steindl had commanded Destroyer Squadron Seven while Shannon takes command of the Military Sealift Command. On 28 January 2014, Admiral Steindl was relieved by Read Admiral Christopher Grady. While in command, Steindl oversaw oversaw the strike group's carrier qualifications that produced more than 1,612 sorties, 1,827 arrested landings, and 2,471 flight hours. A surface warfare officer, Admiral Grady commanded Destroyer Squadron 22 during its deployment to the U.S. Fifth Fleet with Carrier Strike Group Two. On 25 July 2013, the frigate Rentz began its final deployment prior to its decommissioning in 2014 (pictured). The frigate McClusky participated in a Task Group Exercise (TGEX) with the U.S. and Canadian warships between 7–11 October 2013. The destroyer Stockdale completed an extended 10-month deployment to the middle East on 8 November 2013. At the start of 2014, Carrier Strike Group One was in port and not underway. On 16 January 2014, USS Carl Vinson departed Naval Air Station North Island, California, to begin its Tailored Ship's Training Availability (TSTA) pre-deployment exercise with the Carrier Air Wing 17 and the rest of Carrier Strike Group One. These TSTA training drills and associated real-world scenarios emphasized damage control, flight deck operations, and simulated combat for the units of the carrier strike group, with each training phase evaluated by Afloat Training Group Pacific. Following the TSTA drills, Carrier Strike Group One began its Final Evaluation Problem (FEP) drill. While underway, the strike group flew 1,609 air sorties, including 761 at night (pictured), earning certification from Commander, Naval Air Forces Pacific to continue to the next phase of its training. On 10 February 2014, Carrier Strike Group One returned to Naval Air Station North Island, California, completing the TSTA/FEP phase of its pre-deployment exercises. On 21 March 2014, Carrier Strike Group One completed its three-week-long Fleet Synthetic Training-Joint Exercise. Such exercises allow carrier strike groups to train with other branches of the U.S. military while the ships are in port by connecting to a U.S. Third Fleet simulation gaming network under the supervision of Tactical Training Group Pacific (TTGP) based at Naval Base Point Loma, California. On 2 June 2014, the carrier strike group successfully completed its Composite Training Unit Exercise (COMPTUEX) off the coast of Southern California. These exercise evaluated the strike group's ability to react to live-training scenarios as an integral unit throughout every phase of naval warfare including sub-surface, surface, and air scenarios. COMPTUEX is the capstone of the integrated training phase for Carrier Strike Group One, and it required the entire strike group to defeat simulated adversaries across the full spectrum of naval warfare. On 9 June 2014, the strike group successfully completed its Joint Task Force Exercise (JTFEX) off the southern coast of California. JTFEX is an integrated battle force exercise designed to test the capabilities of carrier strike groups operating within a joint environment. It represented culmination of months of training for Carrier Strike Group One in preparation for its upcoming overseas deployment later in this summer. On 22 August 2014, Carrier Strike Group One departed on its 2014–2015 deployment to the U.S. Seventh Fleet in the western Pacific Ocean and the U.S. Fifth Fleet in the Indian Ocean. The strike group completed an Undersea Warfare Exercise (USWEX) on 3 September 2014. Task Forces 32 (Third Fleet maritime patrol and reconnaissance aircraft) and Task Force 34 (theater-wide anti-submarine warfare force) took part in the exercise, along with units from Australia and Canada. On 9 September 2014, Carrier Strike Group One entered the U.S. Seventh Fleet's area of responsibility. On 12 September 2014, two F/A-18C Hornet single-seat strike fighters collided and crashed approximately 250 nautical miles (460 km; 290 mi) west of Wake Island. One aircraft was from squadron VFA-94 and the other was from squadron VFA-113. Both squadrons were based at Naval Air Station Lemoore, California, and both squadrons were part of Carrier Air Wing Seventeen embarked aboard Carl Vinson. One aviator was recovered in fair condition and received medical treatment aboard the Carl Vinson. Search-and-rescue (SAR) operations continued for the other aviator (pictured). The strike group was participating in Exercise Valiant Shield 2014 at the time of the mid-air collision. The search was called off on 14 September 2014, and the missing aviator was declared missing and presumed dead, with the crash incident under investigation. Following a port visit to Singapore, Carrier Strike Group One entered the U.S. Fifth Fleet's area of responsibility on 15 October 2014. On 19 October 2014, Carrier Strike Group One began flying air combat missions in support of Operation Inherent Resolve, the U.S.-led air campaign against ISIL in Iraq and Syria (pictured). On 15 February 2015, the French Navy's Task Force 473, led by the nuclear aircraft carrier Charles de Gaulle, transited the Strait of Hormuz, joining Carrier Strike Group One in the Persian Gulf. Both carrier task groups began operating together (pictured), flying over 100 sorties per day. Charles De Gaulle's Super-Etendard and Rafale fighter jet aircraft flew 15 sorties per day while Carl Vinson's aircraft flies up to 25 combat sorties a day. The rest of the sorties flown were high-end training flights. On 13 April 2015, Carrier Strike Group Twelve relieved Carrier Strike Group One as Task Group 50 in the Gulf of Oman. In support of Operation Inherent Resolve, the strike group flew 12,300 sorties, including 2,383 combat missions; landed more than 9,220 aircraft; and dropped 869 precision guided munitions for a total of more than 500,000 lb (230,000 kg) of ordnance delivered on target. On 27 March 2015, the USS Sterret took part in the air-sea rescue that successfully recovered the pilots of two F-15 fighter jet that may have been part of Operation Decisive Storm, the Saudi Arabian-led multilateral air campaign against Houthis forces in Yemen. On 1 April 2015, the Sterret carried out a boarding of the Panamanian-flagged merchant ship Saisaban in support of the U.N.-authorized arms embargo against Houthi forces in Yemen. On 16 April 2015, Carrier Strike Group One departed the U.S. Fifth Fleet, completing its six-month deployment. The strike group departed the U.S. Seventh Fleet on 23 May 2015. After Carrier Strike Group paid its final 2015 port call at Naval Station Pearl Harbor, a MH-60S Seahawk helicopter from squadron HS-15 rendered assistance to a mariner, who had been alone at sea for more than 30 days aboard his 35-foot sailboat, in the Pacific Ocean more than 400 nautical miles (740 km; 460 mi) off the coast of Honolulu on 31 May 2015. On 4 June 2015, Carrier Strike Group One arrived back at Naval Base Point Loma, California, concluding its 10-month deployment to the U.S. Fifth and Seventh fleets. ↑ The motto of Mississippi. ↑ Destroyer Squadron One consists of the Arleigh Burke-class destroyers USS Stockdale (DDG-106), USS Gridley (DDG-101), USS Higgins (DDG-76), USS Benfold (DDG-65), and USS Russell (DDG-59), as well as the Oliver Hazard Perry-class frigates USS Rentz (FFG-46), USS Gary (FFG-51), and USS McClusky (FFG-41). ↑ U.S. naval vessels included the carrier Carl Vinson, the cruiser Bunker Hill, the destroyer Halsey, the submarine Louisville, and the fast combat support ship Bridge. ↑ Original number, with operational loss of F/A-18C on 12 September 2014. ↑ 14–18 November 2014, 21–26 February 2015, and 2–12 April 2015 for USS Carl Vinson; 19–23 November 2014 and 14–18 January 2015 for USS Sterett; 14–18 November 2014, 21– 26 February 2015, and 2–12 April 2015 for USS Bunker Hill; 8–12 April 2015 for USS Dewey. ↑ USS Dewey with Yemeni Coast Guard patrol vessel Sana'a. USS Gridley with HMS Bulwark. 1 2 3 4 "Navy Establishes Carrier Strike Group 1". NNS091002-03. Commander, U.S. 3rd Fleet Public Affairs. 2 November 2009. Retrieved 23 August 2010. ↑ "Carrier Carl Vinson One at North Island". Navy Times. 13 April 2010. Retrieved 23 August 2010. 1 2 Mass Communication Specialist 1st Class Travis S. Alston, USN (28 May 2015). "Team Carl Vinson Assists Distressed Mariner". NNS150601-17. USS Carl Vinson Public Affairs. Retrieved 2 June 2015. 1 2 Mass Communication Specialist 1st Class Travis S. Alston, USN (28 May 2015). "Team Vinson Departs U.S. 7th Fleet". NNS150511-07. USS Carl Vinson Public Affairs. Retrieved 2 June 2015. 1 2 3 "CSG-1 Holds Change of Command at Sea". NNS150717-12. USS Carl Vinson (CVN 70) Public Affairs. 17 July 2015. Retrieved 14 September 2015. ↑ "Captain Robert Sanders, USN". Chief of Staff. Carrier Strike Group One. 2014. Retrieved 30 January 2014. ↑ "ETCM(SW/AW) Toby Cadwell, USN". Carrier Strike Group One. 2014. Retrieved 30 January 2014. 1 2 3 4 5 6 7 Morison, Samuel Loring (September 2014). "U.S. Battle Force Aviation Changes 2013-14". Naval Institute Proceedings. 140 (9): 48–50. ISSN 0041-798X. Retrieved 13 September 2014. Registration required; downloadable PDF file. ↑ "Current DESRON ONE Ships". COMDESRON ONE. U.S. Navy. 2015. Retrieved 3 June 2015. ↑ "COMMANDER, CARRIER STRIKE GROUP 1". History and Mission. U.S. Navy. 2015. Retrieved 5 June 2015. 1 2 3 4 5 6 7 8 9 10 "2014 History". USS Carl Vinson CVN-70. USCarrier.net. 3 October 2014. Retrieved 3 October 2014. ↑ "Naval Aeronautical Organization – 1933" (PDF). Op-38-ED-u/(SC)-VZ/A-31. Washington Naval Yard: Naval History & Heritage Command. 1 May 1931. p. 6. Retrieved 11 July 2011. 1 2 "Carrier Group One". Military. GlobalSecurity.org. 26 April 2005. Retrieved 8 January 2011. ↑ "Shake Down and Operation Frostbite". Midway History and Events. CV41.org. 2012. Retrieved 1 August 2012. ↑ See Thomas A. Bryson, Tars, Turks, and Tankers: The Role of the United States Navy in the Middle East, 1800–1979, Scarecrow, 1980, 92–95. ↑ Captain Paul Ryan, USN (November 1974). "An interview with Captain Henri H. Smith-Hutton, regarding his command of the U.S.S. Little Rock". Oral History Program. USS Little Rock Association. Retrieved 4 August 2011. ↑ Chace, James (2006). "Part 1 – First Skirmishes: The Day the Cold War Started". In Cowley, Robert. The Cold War: A Military History. New York: Random House. p. 11. ISBN 978-0-81296-716-6. ↑ Naval Aeronautical Organization OPNAV NOTICE 05400 for Fiscal Year 1956 dated 1 August 1955, 19. ↑ "OPNAV NOTICE C5400: Naval Aeronautical Organization for January 1974" (PDF). Aviation Ships: U.S. Pacific Fleet, Aircraft Carriers. Washington, DC: Office of the Chief of Naval Operations: 172. January 1974. Retrieved 1 March 2011. ↑ Lt. Cmdr. Gabe E. Soltero, USN (15 February 2005). "Strike Force Training Pacific Changes Command on Reagan". NNS050215-07. Strike Force Training Pacific Public Affairs. Retrieved 7 January 2011. 1 2 3 Journalist Daniel Bristol (28 October 2010). "Carrier Strike Group One Conducts Change of Command Ceremony". NNS060607-16. USS Carrier Strike Group One Public Affairs. Retrieved 30 October 2014. 1 2 3 4 "Carrier Strike Group 1 Conducts Change of Command". NNS111119-03. Carrier Strike Group 1 Public Affairs. 19 November 2011. Retrieved 1 December 2011. 1 2 3 "Carrier Strike Group One Holds Change of Command". NNS130221-33. Carrier Strike Group 1 Public Affairs. 21 February 2013. Retrieved 30 January 2014. 1 2 3 "CSG-1 Holds Change of Command at Sea". NNS140128-16. Carrier Strike Group 1 Public Affairs. 28 January 2014. Retrieved 30 January 2014. 1 2 "USS Carl Vinson CVN-70". U.S. Carriers: United States Ships (USS) history and deployments. 17 August 2010. Retrieved 23 August 2010. 1 2 Mass Communication Specialist 1st Class (SW/AW) Jason Thompson, USN (29 March 2010). "Carl Vinson Visits Callao, Peru". NNS100329-08. USS Carl Vinson (CVN-70) Public Affairs. Retrieved 24 May 2011. ↑ Lance M. Bacon (13 January 2010). "Carl Vinson, other ships headed to Haiti". Navy Times. Retrieved 23 August 2010. ; MCS 2/c Robert A. Wood Sr. (13 January 2010). "Vinson Deploys to Respond to Haiti Earthquake". NNS100113-11. Naval Forces Southern Command Public Affairs. Retrieved 23 August 2010. ; and "USS Carl Vinson arrives in Haiti to support humanitarian operations". BYM Marine & Maritime News. 15 January 2010. Retrieved 23 August 2010. ↑ Mass Communication Specialist 1st Class Jason Thompson, USN (15 January 2010). "USS Carl Vinson Arrives in Haiti to Support Humanitarian Operations". NNS100115-03. USS Carl Vinson Public Affairs. Retrieved 20 April 2009. and "USS Carl Vinson's choppers rush supplies to Haitians". The Herald. Nation/World. 15 January 2010. Retrieved 2 May 2012. ↑ Fuentes, Gidget (16 January 2010). "Bunker Hill en route to help Haiti mission". Navy Times. Retrieved 16 January 2010. ↑ MCS 2/c Daniel Barker, USN (4 February 2010). "Carl Vinson's Supply Department Overcame Obstacles Getting Aid To Haiti". NNS100204-13. USS Carl Vinson Public Affairs. Retrieved 24 August 2010. ↑ Gordon Lubold (1 February 2010). "USS Vinson to leave Haiti soon, signaling turning point in aid efforts". The Christian Science Monitor. USA. Retrieved 2 May 2012. 1 2 3 4 "USS Carl Vinson Arrives in San Diego". San Diego News. KGTV. 12 April 2010. Retrieved 2 May 2012. ↑ Lauren King (2 February 2010). "The Carl Vinson departs Haiti". The Virginian-Pilot. Retrieved 20 April 2009. ↑ "Argentina-United States in joint exercise". Aviation Boatswain's Mates Association. 18 March 2010. Retrieved 23 August 2010. ↑ Mass Communication Specialist 1st Class (SW/AW) Jason Thompson, USN (9 March 2010). "Carl Vinson Unites with Argentina for Southern Seas 2010". NNS100309-04. USS Carl Vinson Public Affairs. Retrieved 23 August 2010. ↑ Mass Communication Specialist 1st Class (SW/AW) Jason Thompson, USN (3 March 2010). "Carl Vinson Hosts Brazilian Naval Academy Mids". NNS100303-29. Retrieved 24 May 2011. 1 2 Mass Communication Specialist 2nd Class Byron C. Linder, USN (9 May 2011). "Carrier Strike Group One Arrives in 7th Fleet". NNS110509-01. USS Carl Vinson Public Affairs. Retrieved 10 May 2011. ↑ "US Navy, International Forces Respond to Piracy Attack". NNS110506-15. U.S. 5th Fleet Public Affairs. 6 May 2011. Retrieved 10 May 2011. ↑ "Indian Navy thwarts pirate attack; rescues Chinese vessel, crew". Indo-Asian News Service. NDTV. 6 May 2011. Retrieved 10 May 2011. ↑ "NATO, Iranian Forces Thwart Several Pirate Attacks". navaltoday.com. 12 May 2011. Retrieved 20 April 2009. ↑ "Carl Vinson winding up historic deployment". Navy Times. All Navy News. 10 June 2011. Retrieved 13 June 2011. ↑ "Carl Vinson Strike Group to Depart for Training, Deployment". NNS101130-01. U.S. 3rd Fleet Public Affairs. 30 November 2010. Retrieved 3 December 2010. 1 2 Ensign Samantha J Carnahan, USN (2 March 2011). "USS Higgins Crew Fosters Partnership During Maldives Visit". NNS110302-01. U.S. 7th Fleet Public Affairs. Retrieved 11 May 2011. ↑ Mass Communication Specialist 2nd Class Byron C. Linder, USN. "USS Carl Vinson Strike Group Arrives in Seventh Fleet". NNS101231-02. Commander, Seventh Fleet Public Affairs. Retrieved 20 April 2009. 1 2 Morison, Samuel Loring (May 2011). "U.S. Naval Battle Force Changes 1 January 2010—31 December 2010: Aircraft Carrier Air Wing Assignments and Composition as of 1 March 2011". Naval Institute Proceedings. 137 (5): 120. ISSN 0041-798X. Retrieved 9 May 2011. Registration required. ↑ "CVW-17 (AA) – CVN-70 Carl Vinson November 30, 2010 – June 15, 2011 (COMPTUEX, WestPac, North Arabian Sea)". Carrier Air Wing Seventeen (CVW-17). GoNavy. 22 June 2011. Retrieved 1 December 2011. 1 2 Mass Communication Specialist 2nd Class (SW) James R. Evans, USN (11 January 2001). "Stockdale, Gridley Conduct a Passing Exercise with JMSDF". NNS110111-01. USS Carl Vinson Public Affairs. Retrieved 11 January 2011. ↑ "USS Abraham Lincoln CVN 72". USCarrier.com. 16 February 2011. Retrieved 9 March 2011. ↑ "Carl Vinson CSG to Visit Republic of Korea". NNS110107-02. USS Carl Vinson Carrier Strike Group Public Affairs. 7 January 2001. Retrieved 11 January 2011. ↑ Mass Communication Specialist 3rd Class Christopher K. Hwang, USN (10 January 2011). "Korean-American Carl Vinson Sailors Returning Home For Busan Port Visit". NNS110110-03. USS Carl Vinson Public Affairs. Retrieved 11 January 2011. ↑ Mass Communication Specialist 3rd Class Lori D. Bent, USN (14 January 2010). "Carl Vinson Sailors Reach out to Children in Busan". NNS110114-08. USS Carl Vinson Public Affairs. Retrieved 13 January 2011. ↑ "January 2011 Images". Imagery. Commander U.S. Seventh Fleet. 2011. Retrieved 24 June 2011. ↑ "Phuket Visitors". News. Glemm Defense Marine Asia. 22 February 2011. Retrieved 24 June 2011. ↑ "USS Carl Vinson docks at Port Klang". Borneo Post. 23 January 2011. Retrieved 10 May 2011. ↑ Mass Communication Specialist 2nd Class Byron C. Linder, USN (15 May 2011). "Carrier Strike Group 1 Arrives in Manila Bay, Philippines". NNS110515-01. USS Carl Vinson Public Affairs. Retrieved 16 May 2011. ↑ "Wary of security, Navy won't talk about bin Laden". Associated Press. 15 May 2011. Retrieved 15 May 2011. ↑ "American aircraft carrier USS Carl Vinson leaves Manila". Breaking. The Nation. 20 May 2011. Retrieved 19 May 2011. ↑ "US carrier that buried bin Laden allowed to dock". Local. 20 May 2011. Retrieved 19 May 2011. ↑ Alex Frangos (22 May 2011). "U.S. Carrier That Buried Bin Laden Visits Hong Kong". Hong Kong News. Retrieved 10 June 2011. ↑ Jaymes Song (7 June 2011). "Navy ship that buried bin Laden stops in Hawaii". Associated Press. Retrieved 10 June 2011. 1 2 "USS Carl Vinson Strike Group Departs for Deployment". NNS111130-04. Commander, Naval Air Forces Pacific Public Affairs. 30 November 2011. Retrieved 1 December 2011. ↑ Mass Communication Specialist 3rd Class (SW) Luke B. Meineke, USN (1 December 2011). "Carl Vinson and CVW 17 Depart on Western Pacific Deployment". NNS111201-02. USS Carl Vinson Public Affairs. Retrieved 1 December 2011. ↑ "Daring enjoys 'truly amazing' experience working with American carriers". News & Events. Royal Navy. 20 March 2012. Archived from the original on 22 March 2012. Retrieved 23 March 2012. ↑ "2012 History". Naval Air News. OPNAV N88. August 2013. Retrieved 10 January 2014. and "USS Halsey Gives Aid to Yemeni Dhow". NNS120122-02. Combined Maritime Forces Public Affairs. 22 January 2012. Retrieved 10 January 2014. ↑ Phil Stewart (11 January 2012). "U.S. military moves carriers, denies Iran link". Reuters. Retrieved 13 January 2012. 1 2 "U.S. 7th Fleet to Conduct Exercise". NNS120406-03. U.S. 7th Fleet Public Affairs. 6 April 2012. Retrieved 10 May 2012. 1 2 Mass Communication Specialist 3rd Class Christopher Farrington, USN (6 May 2012). "Battle of Coral Sea Remembered by Veterans, U.S. and Royal Australian Navies in Brisbane, Australia". NNS120506-03. USS Halsey Public Affairs. Retrieved 10 May 2012. ↑ Mass Communication Specialist 3rd Class (SW/AW) Luke B. Meineke, USN (13 May 2012). "CSG-1 Makes History in Oceania Maritime Security Initiative". NNS120513-02. USS Carl Vinson Public Affairs. Retrieved 16 April 2012. 1 2 Mass Communication Specialist 2nd Class (SW) Byron C. Linder, USN (12 May 2012). "Carl Vinson Returns to 3rd Fleet". NNS120512-02. USS Carl Vinson Public Affairs. Retrieved 16 April 2012. ↑ Angelique Lizarde (23 May 2012). "USS Carl Vinson strike group returns to San Diego". KFMB-TV. Retrieved 23 May 2012. and "Carl Vinson, strike group return to San Diego". Navy Times. News. 22 May 2012. Retrieved 23 May 2012. 1 2 3 4 5 6 7 "2011 History". USS Carl Vinson CVN-70. USCarrier.net. 22 September 2011. Retrieved 22 September 2011. ↑ Morison, Samuel Loring (May 2012). "U.S. Naval Battle Force Changes 1 January 2011—31 December 2011: Aircraft Carrier Air Wing Assignments and Composition as of 2 April 2012". Naval Institute Proceedings. 138 (5): 113. ISSN 0041-798X. Retrieved 11 May 2012. Registration required. ↑ MCS 2/c Byron Linder (30 December 2011). "USS Carl Vinson Departs Hong Kong". NNS111230-03. USS Carl Vinson Public Affairs. Retrieved 31 December 2011. 1 2 3 "2012 History". USS Bunker Hill CG-51. USCarrier.net. 16 March 2013. Retrieved 14 January 2014. ↑ Todd Cardy (23 April 2012). "Thousands of US sailors arrive on USS Carl Vinson ahead of Anzac Day". PerthNow. Australia. Retrieved 2 May 2012. ↑ MCS 2/c 2nd Class Tiarra Fulgham (17 May 2012). "Carl Vinson visits Hawaii during Return to San Diego Homeport". NNS120517-10. USS Carl Vinson Public Affairs. Retrieved 17 May 2012. ↑ Mass Communication Specialist 3rd Class Matthew J. Haran, USN (10 July 2012). "Carl Vinson Enters Planned Incremental Availability Period". NNS120710-12. USS Carl Vinson Public Affairs. Retrieved 23 July 2012. and Mass Communication Specialist Seaman Apprentice Samuel LeCain, USN (5 September 2012). "PIA Focuses on Habitability Aboard Carl Vinson". NNS120905-08. USS Carl Vinson Public A0ffairs. Retrieved 1 October 2012. ↑ MCS 3/c Heather Roe (5 February 2013). "Carl Vinson Completes PIA". NNS120905-08. USS Carl Vinson Public Affairs. Retrieved 21 February 2013. and MCS 3/c Heather Roe (14 February 2013). "USS Carl Vinson, CVW-17 Earn Carrier Qualifications". NNS120905-08. USS Carl Vinson Public Affairs. Retrieved 21 February 2013. ↑ "2013 History". USS Carl Vinson CVN-70. USCarrier.net. 22 September 2011. Retrieved 12 December 2013. ↑ "2013 History". USS Gridley DDG-101. USCarrier.net. 11 October 2013. Retrieved 14 January 2014. ↑ "2012 History". USS Higgins DDG-76. USCarrier.net. 18 November 2012. Retrieved 14 January 2014. 1 2 "2013 History". USS McClusky FFG-41. USCarrier.net. 22 November 2013. Retrieved 14 January 2014. ↑ "2013 History". USS Rentz FFG-46. USCarrier.net. 13 January 2014. Retrieved 14 January 2014. ↑ "2012 History". USS Stockdale DDG-106. USCarrier.net. 11 November 2013. Retrieved 14 January 2014. ↑ "U.S. Naval Update Map: Dec. 31, 2013". STRATFOR. 2 January 2014. Retrieved 6 January 2014. Registration required. and "U.S. Naval Update Map: Jan. 9, 2014". STRATFOR. 9 January 2014. Retrieved 9 January 2014. Registration required. ↑ Mass Communication Specialist Seaman Apprentice James Bleyle, USN (10 February 2014). "Carl Vinson Completes TSTA/FEP". NNS140210-05. USS Carl Vinson Public Affairs. Retrieved 18 February 2014. ↑ Mass Communication Specialist 2nd Class Brent Pyfrom, USN (21 March 2014). "Carl Vinson Carrier Strike Group Completes Fleet Synthetic Training". NNS140321-31. Commander, U.S. Third Fleet Public Affairs. Retrieved 22 March 2014. ↑ Mass Communication Specialist 2nd Class Brent Pyfrom, USN (7 June 2014). "CSG 1 Completes Composite Training Unit Exercise". NNS140321-31. Commander, U.S. Third Fleet Public Affairs. Retrieved 8 June 2014. ↑ Mass Communication Specialist 2nd Class Brent Pyfrom, USN (7 June 2014). "Carl Vinson Carrier Strike Group is Ready to Deploy". NNS140613-21. USS Carl Vinson Public Affairs. Retrieved 21 June 2014. 1 2 "Carl Vinson Carrier Strike Group Departs for Deployment". NNS140822-07. Commander, U.S. Third Fleet Public Affairs. 11 August 2014. Retrieved 10 September 2014. 1 2 Mass Communication Specialist Seaman James P. Bleyle, USN (6 September 2014). "Carl Vinson Completes USWEX". NNS140906-11. USS Carl Vinson Public Affairs. Retrieved 10 September 2014. ↑ Mass Communication Specialist 2nd Class Travis Alston, USN (9 September 2014). "Carl Vinson Carrier Strike Group Arrives in 7th Fleet AOR". NNS140909-14. Carl Vinson Public Affairs. Retrieved 10 September 2014. 1 2 "UPDATED: Navy F/A-18 Hornets Crash in Pacific Ocean". NNS140912-15. U.S. 7th Fleet Public Affairs. 12 September 2014. Retrieved 12 September 2014. and Sam LaGrone (12 September 2014). "'Updated: Two F/A-18C Hornets Collided and Crashed Near Mariana Islands , One Pilot Missing". News Blog. United States Naval Institute. Retrieved 12 September 2014. ↑ Jeff Schogol (14 September 2014). "Navy identifies Hornet pilot presumed dead after collision". Navy Times. Retrieved 15 September 2014. 1 2 Mass Communication Specialist Seaman James P. Bleyle, USN (15 October 2014). "Carl Vinson Carrier Strike Group Checks in to US 5th Fleet". NNS141015-03. Carl Vinson Public Affairs. Retrieved 15 October 2014. ↑ Sam LaGrone (20 February 2015). "Defense Official: French Carrier Enters Persian Gulf, ISIS Strike Missions Could Start Soon". News Blog. United States Naval Institute. Retrieved 24 February 2015. ↑ "French, US Navies Integrate Under Operation Inherent Resolve". NNS150409-10. USS Carl Vinson Public Affairs. 9 April 2015. Retrieved 28 April 2015. 1 2 Mass Communication Specialist Seaman D'Andre L. Roden, USN (17 April 2015). "Team Carl Vinson Departs US 5th Fleet". NNS150417-02. USS Carl Vinson Public Affairs. Retrieved 20 April 2015. ↑ "U.S. Rescues Saudi Pilots from Crashed Fighter Jet". Wall Street Journal. News Corp. 27 March 2015. Retrieved 2015-04-28. 1 2 3 4 5 6 "2014 History". USS Dewey DDG-105. USCarrier.net. 12 November 2014. Retrieved 28 November 2014. ↑ "U.S. Moves to Stem Iran Arms Flow to Yemen". Wall Street Journal. News Corp. 12 April 2015. ↑ Mass Communication Specialist 1st Class Travis S. Alston, USN (28 May 2015). "Team Carl Vinson Assists Distressed Mariner". NNS150528-02. USS Carl Vinson Public Affairs. Retrieved 2 June 2015. ↑ "Carl Vinson Carrier Strike Group Returns from Western Pacific, U.S. Central Command Deployment". Number: NNS150604-24. Commander, Carrier Strike Group (CSG) 1 Public Affairs. 4 June 2015. Retrieved 5 June 2015. ↑ "Valiant Shield 2014". Valiant Shield 2014 News Articles. Commander Naval Surface Force, U.S. Pacific Fleet. September 2014. Retrieved 26 September 2014. 1 2 3 4 "2014 History". USS Sterett DDG-104. USCarrier.net. 12 November 2014. Retrieved 28 November 2014. 1 2 "2014 History". USS Bunker Hill CG-52. USCarrier.net. 27 April 2015. Retrieved 28 April 2015. 1 2 3 4 "2014 History". USS Gridley DDG-101. USCarrier.net. 12 November 2014. Retrieved 28 November 2014. ↑ Mass Communication Specialist 3rd Class James Vazquez, USN (12 December 2014). "Dewey Departs Salalah". Navy Public Affairs Support Element West. Retrieved 18 December 2014. ↑ Mass Communication Specialist 1st Class Travis S. Alston, USN (11 May 2015). "Carl Vinson Strike Group Conducts Exercises With Royal Malaysian Military". NNS150511-07. USS Carl Vinson Public Affairs. Retrieved 2 June 2015. Morison, Samuel Loring (May 2009). "U.S. Naval Battle Force Changes 1 January 2008—31 December 2008: Aircraft Carrier Air Wing Assignments and Composition as of 17 Feb 2009". Naval Institute Proceedings. 135 (5): 118–120. ISSN 0041-798X. Retrieved 26 August 2010. Registration required. —— (May 2012). "U.S. Naval Battle Force Changes 1 January 2011—31 December 2011: Aircraft Carrier Air Wing Assignments and Composition as of 2 April 2012". Naval Institute Proceedings. 138 (5): 113. ISSN 0041-798X. Retrieved 11 May 2012. Registration required. —— (September 2014). "U.S. Battle Force Aviation Changes 2013-14". Naval Institute Proceedings. 140 (9): 48–50. ISSN 0041-798X. Retrieved 13 September 2014. Registration required; downloadable PDF file covering 2013 and 2014. Eric Schmitt (16 December 2014). "Attacking Islamic State, from a Navy aircraft carrier". The Virginian-Pilot. Retrieved 17 December 2014. Originally published in the The New York Times.